As early as this week BP may announce the purchase of a key stake in a potential new oil field that belongs to Russia's oil giant Rosneft. This will be the first large deal between a western investor and the Russian company, which is on the list of EU and US sanctions. Experts believe that selling assets is the only way that Russian companies can obtain additional capital. According to the Financial Times, British oil giant BP is poised to take a 20 percent state in Rosneft's Siberian Taas-Yuriakh oil field. The deal, which is worth about $700 million, may be announced during the St. Petersburg International Economic Forum, which opened June 18. In an interview with CNBC in June, Robert Dudley, the boss of the BP, said the company would "develop additional investment opportunities" with Russia. Sergey Pikin, head of the Energy Development Foundation, believes that BP has obtained permission for the deal from the British government. He says that BP's actions are not affected directly by the restrictions. 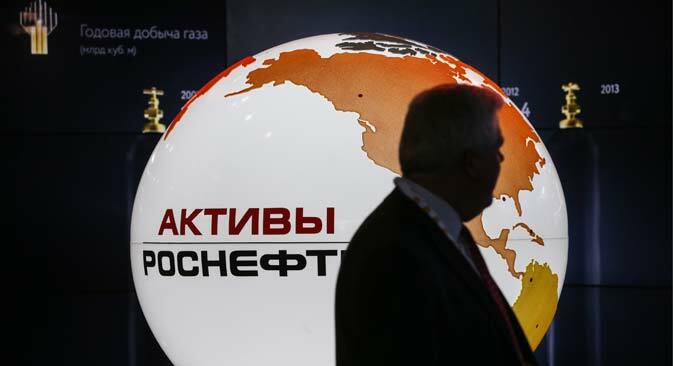 "The deal does not concern the purchase of Rosneft, but the purchase of a part of a deposit. From a legal viewpoint, this deal does not come under the terms of the sanctions." Despite the sanctions introduced by the EU, other European companies are also keen to continue doing business with Russia. "Work is being carried out with Italy's Eni, Norway's Statoil and French company Total, all which turn to their governments and ask for permission to realize certain projects with Russia," said Alexander Pasechnik, chief analyst at the National Foundation of Energy Security. "And often they receive it." Eni and Statoil have received approval to work with Rosneft, while Shell, which currently collaborates with Gazprom, has been permitted by the Dutch government to carry out projects with other Russian companies. Pikin says there are clear economic benefits in allowing companies to do deals with Russia: "European oil companies contribute significant tax receipts, which is why national governments have such a reverent attitude towards them." "From the perspective of geopolitics, the Russian market is not as risky for global companies as markets in Iran, Iraq and Latin America," Pasechnik added. "Moreover, Russia has a rich resource base." Experts say that the main hardship created by the sanctions against Russia is the lack of western financing. Even those companies not on the sanctions list are finding it very costly and difficult to obtain credit abroad. "In order not to borrow at high interest rates, including from Asia, companies prefer selling their assets," said Pikin. "It is a cheaper way of attracting capital. Even though for the government this is not the most advantageous solution, considering the fact that very good and economically important assets are sold." "Thanks to the deal with BP, Rosneft will receive not only cash but also a solid technological base," Pasechnik added. "Both are particularly significant, since they will help the company produce oil at a more intensive level." In 2014, Energy Ministry figures show that Rosneft's oil production fell by 0.9 percent to 190.9 million tons. In 2015 Gazprombank experts predict a further decline of 0.5 percent due to exhausting deposits. "Rosneft may be faced with a risk of failing to fulfil long-term oil supply contracts made with China," Pasechnik said. In 2013 the company signed an agreement with China for the supply of 300,000 barrels of oil a day via the Eastern Siberian-Pacific Ocean pipeline. The pipeline has the daily capacity to carry three times that much. What will Tehran’s return to market mean for Russia?